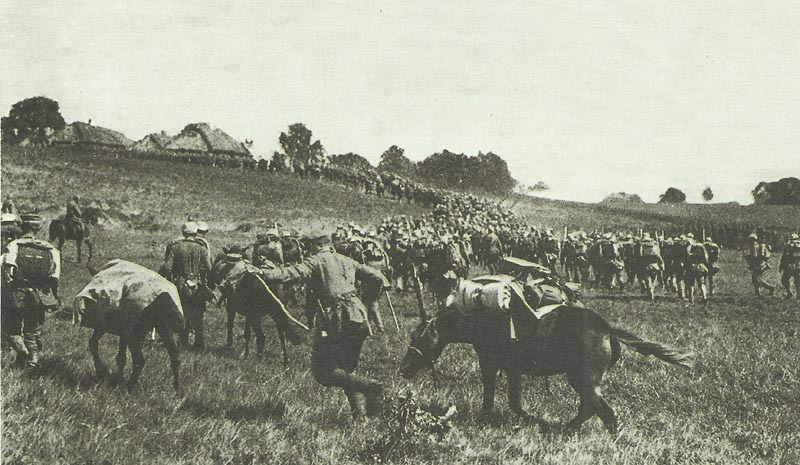 German troops moving forward in their attempt to reach the besieged fortress of Przemysl. Galicia – Przemysl surren­ders: 9 generals among 119,602 PoWs and 700 guns, 20% scurvy, 3 days rations left. Aisne: Germans bombard Soissons Cathedral until March 23. Dardanelles: Hamilton says his troops cannot be ready till April 14. Dardanelles: Admiral Robeck decides naval attack renewal not possible, troops needed. His CoS Keyes considers Dardanelles forceable with destroyer­-minesweepers after April 4.